Dad came to visit! 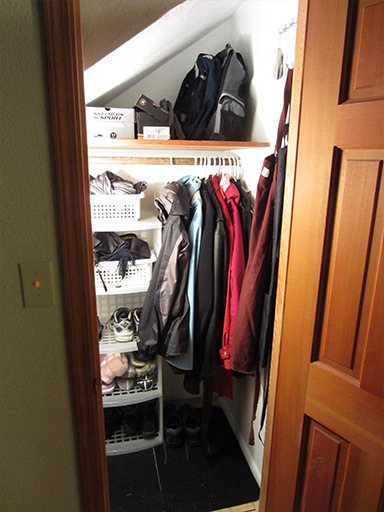 He banged out an awesome front closet upgrade, and he did it so fast I didn’t even get too many photos of it. 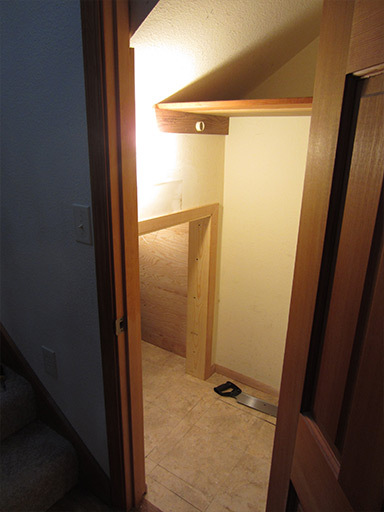 He knocked out part of the left wall to reveal a TON of space underneath the stairs to the second floor. He finished the wall with some plywood, which he cut to fit, and tiled the floors. (The musty old carpet inside is history, woo!) 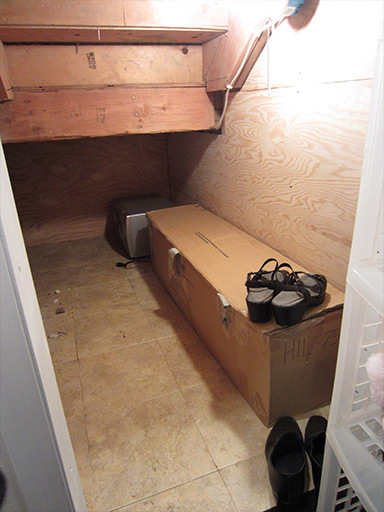 This house is very stingy with storage space so opening up this space is incredibly useful to us. And as if that wasn’t enough, he added two lightbulb fixtures, one to the main closet and one to the storage section. This closet is notoriously dark, but no more! And since he was already working with the electrical, he ALSO added a new outlet outside the closet (right over the first step) to make plugging in the stair vacuum much easier. My dad is awesome. That rectangular hole bordered with trim? Yeah, it totally wasn’t there a week ago. Can you believe all this space has been sitting unused since 1977? Now it holds our lawn chairs, Christmas tree, ski equipment, extra kitchen plates, and more!! The closet was very scuffed and marred from years of use by previous owners, so I gave everything inside a fresh coat of paint.